Huddled at the base of the cliff in Little River Canyon, the doctor and several friends—all rappelling for the first time—grin and agree that the most intimidating part of the adventure is when you’re at the top of the rock you lean back, with nothing below you but air. And even with 20-plus years’ experience rappelling, I still feel this surge of adrenaline when it’s my turn. I lower my body into an L shape and shuffle over the lip of the cliff. When I reach the point where the rock face becomes relatively smooth, I kick hard off the wall, throw my right hand—or “break hand”—away from my hip, and zoom down the rope. Even after all these years, rappelling is still a thrill. 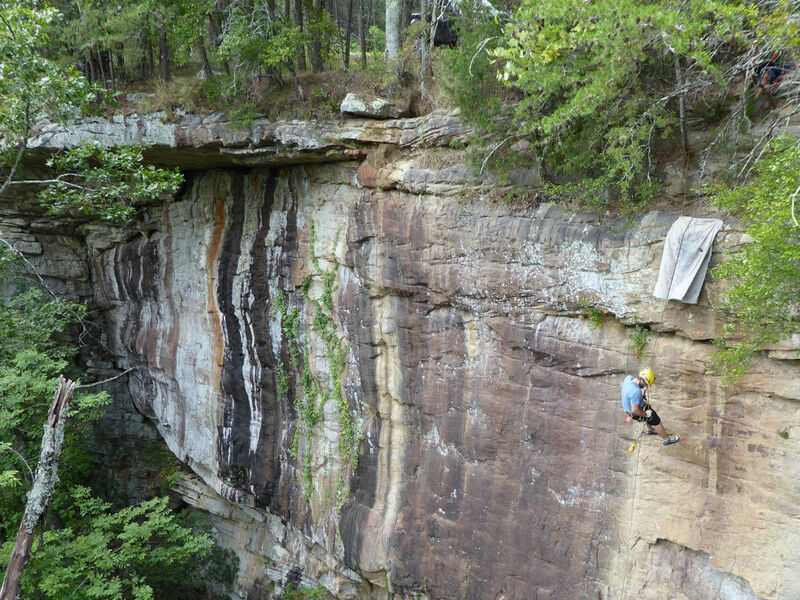 While the West may get the most attention when it comes to rappelling and climbing, the South has been a lesser-known but growing rappelling hotspot for decades. One reason is because the region is home to many climbers and a healthy population of cavers, and rappelling is a natural extension of those two pursuits. The sport is gaining traction among newbies, too, like our group, most of whom are rappelling for the first time. That’s where a reputable guide service like True Adventure Sports comes in. If you’ve never rappelled, or you haven’t done it in a while, a guided trip is a great way to go. Most importantly, guides provide an essential environment of safety. But the best guides also find a good balance of making you feel comfortable while still feeding your hunger for true adventure. When you’re learning to rappel, safety is the most important consideration. While many people might not consider rappelling an extreme activity, it can certainly be dangerous. In fact, many mountaineers and rock climbers consider rappelling the riskiest part of any climb because they must rely primarily on equipment to keep them safe. 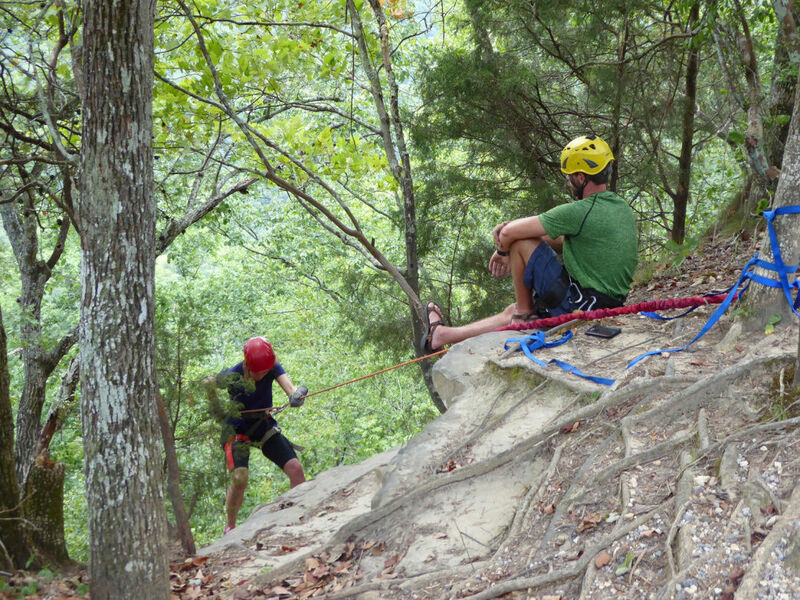 If you don’t secure a harness properly, or if you make a mistake when connecting the rope to your figure 8 rappelling device, a fall is possible. Qualified guides also play a key role in safety. TAS guides, for example, adhere strictly to protocols designed to keep everyone safe. For example, above the cliff they attached a yellow nylon strap to the trees to serve as a “do not cross” line. Customers are not allowed to go beyond the strap and approach the edge of the cliff until the guides attached them to safety lines and gave the OK to proceed. Good guides will also closely inspect harnesses. If we wanted to make any adjustments to ours, for example, we had to get permission and follow certain strict procedures. Adding another layer of safety, a guide stood as the bottom of the cliff and held the end of the rope to belay us. If needed, the guide could completely stop our descent. For the first-timers in our group, these safety measures helped calm their fears. They also benefitted from getting instruction from professionals who are used to helping people overcome their trepidation. When one member of our group was rattled due to her fear of heights, the guides used calm voices and step-by-step instructions to lead her over the edge of the cliff, and they offered encouragement as she made her way down. If you’ve ever tried to learn a sport from a friend, rather than a professional (skiing, for example), you know that the pros are usually more effective and helpful. From the TAS headquarters, it’s just a 15 minute-drive to the rappelling site, and a quick walk from parking spots on the shoulder of the road to reach the bluff where we rappelled. Nearby is rock outcrop that offers a great view of the cliff face. For the first-timers in our group, the half-day time frame proved especially beneficial. When you’re anxious and experiencing an intimidating activity the first time, it saps your energy quickly. After a couple of hours, every person had rappelled a couple of times, and folks were happy but tired, and felt they had gotten their money’s worth. When you’re standing at the top of a cliff that’s nearly eight stories tall and you look down, your gut informs you that what lies ahead (and below) is challenging, risky, and abnormal. When you lower yourself over the edge and hang your backside over the abyss, that feeling really takes over. Because I had rappelled many times before, I felt excited rather than afraid, and the cliff was high enough to allow me to have some fun, bounding down and moving fast. 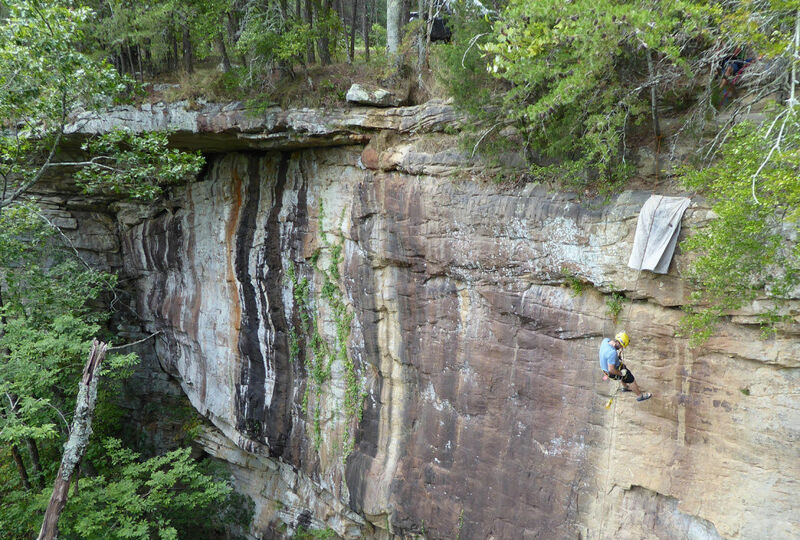 With its towering bluffs, this part of the canyon is also popular with climbers, who refer to the crag as “Unshackled.” From the base of the sandstone and limestone wall, you can see bolts and quickdraws on a face near a long vertical crack. Adding to the sense of adventure is the fact that this area of Little River Canyon is wild and beautiful. From the rock outcrop beside the cliff face, I could gaze down the deep canyon cut, which is bordered by towering ridges with undisturbed forest. During our time there, a few cars crept by on the nearby road, but it was mostly quiet and peaceful. 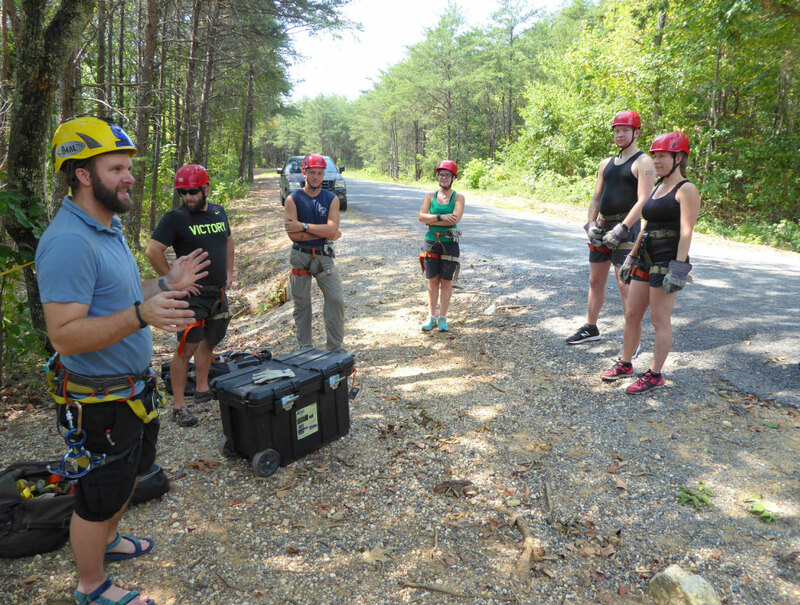 If you’ve always wanted to try rappelling, Fort Payne is an excellent place to do it, and the excursion is perfect for beginners. While you’ll be safe and comfortable, you’ll also feel like you’ve lived—quite literally—on the edge, if even just for a little while. -- Pack enough food to get you through an outing that lasts 3 to 4 hours. -- In warm weather, wear shorts that are long enough to extend easily beyond the leg loops of your harness. This will help you avoid chafing, and prevent your thighs from getting burned by a dangling figure 8 that’s hot due to friction. -- Bring a camera to take advantage of the excellent vantage point for pictures. -- Women with long hair should put their hair up to prevent it from getting caught in rappelling gear.